A franchise business can come in all shapes and sizes. It’s likely, however, that your franchise will require some premises to operate from. This will mean dealing with landlords and commercial leases that can be highly complex legal documents. It can’t be stressed enough that you should get advice from a solicitor that specialises in commercial lease agreements before you sign any documents, even if this is only for a short term lease. The type of premises you need for your franchise business will also have an impact on the kind of lease agreement you will be offered by the landlord that owns the property. From serviced offices to industrial units, leases are tailor-made for the property they are attached to. It’s vitally important to the long-term success of your business franchise that your premises are suitable. Locating the right premises for your business can be easier said than done. Commercial agents can be your guide, but you also need to do your homework and get to know the commercial property market in your area. Online directories like BusinessforSale RightBiz [www.rightbiz.co.uk] and Dalton Business [www.daltonsbusiness.com] offer an array of premises that could be ideal for your franchise business. Often, a lease will allow for an early exit in the first few years of a lease, but after this time has expired, the tenant is in effect locked into the lease no matter what happens to the business. If your business fails, you are still liable for all the rent and associated costs over the remainder of the tenancy, which could be several years. Insurance will either be arranged by your landlord, or will fall to you. If your landlord is providing this get copies of the insurance documentation to ensure they are in order and provide adequate cover. Planning permission will be needed to make any alteration to your business premises. Look out for clauses in your lease agreement that state that you would have to return the premises to their former state when you leave. This could be very expensive. 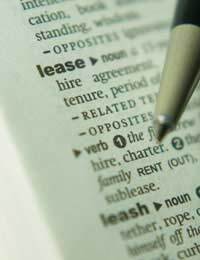 Registering the property is a requirement for all new leases. The Land Registry will detail your premises. Check that this information is correct. It is now the law that all landlords have to provide their tenants in England and Wales with an Energy Performance Certificate.